As someone who has indeed judged many a book by its cover when browsing bookstores, it’s kind of ironic that I’m asking you to look beyond the pictures of my purple posole stew, and take my word for it on the taste. (It’s not like I don’t ever read the backs of and then buy ugly-covered books, and I always read the backs of attractively covered books before actually buying them). But, near non sequitur aside, almost none of the pictures I took while making this dish, and none of the pictures of the finished product were very attractive. At all. The taste, however, was wonderful. I wanted to make use of the gorgeous purple posole I got a few weeks ago from Whole Foods, but wasn’t really thinking about how a stew that is kind of brownish would really look nicer with light-colored posole than it would with purple. Oh well. It was still cool eating purple posole. (Those of you who have been reading my blog for a while are familiar with my affinity for purple things). I love posole – it’s hearty tasting, has a great toothy quality, and is very satisfying. Posole and hominy seem to be used interchangeably by most people, but a few searches turned up an explanation that the two are created using different alkaline components to treat the corn, as well as different types of corn. I’m not completely sure I’ve even eaten hominy, so I can only vouch for posole, but I can tell you, it’s awesome. The treatment used for either type results in less fiber than untreated corn, but the process makes niacin more readily available to the body, so in that respect, it’s more nutritious than sweet corn. Using dried posole takes more time than using canned, but it’s so worth it. There’s not a lot of labor involved at all, just waiting. You soak the posole overnight, and then cooking it takes at least two and a half hours. But I can promise you, your kitchen will smell fantastic. I like to use poultry for posole stew, but you could certainly use pork, or even something more unique like elk. I looked for skinless turkey thighs, but couldn’t find any, so I got chicken thighs instead, which worked quite well. The extra bit of fat in the thighs allows the meat stand up to the long cooking time better than leaner breast meat would. For heat, I had planned to use two poblano peppers, which I swear were labelled as ‘medium’ heat, but they very definitely weren’t hot when I touched a bit to my tongue. So I used them as a textural element only, and grabbed the three dried chipotle peppers I still had from Savory Spice Shop. I broke them in a few pieces, then removed the seeds (the hottest part), and chopped them into smaller pieces. They added a perfect amount of heat, and brought a very nice smoky element to the stew. (You can always adjust the heat level to your liking by adding some cayenne, or using hotter peppers). Below is the only attractive picture I took during the whole process – all the vegetables before I added the chicken, broth and water. Drink it in, in all its beauty, because the next picture will be the not-so-great looking finished product. Soak the posole in water overnight. Combine all ingredients in a large stockpot, and bring to a boil. Reduce heat, and simmer until posole is tender (around 2 and 1/2 hours). After last Saturday’s cooler temperatures, I was hoping that we were done with 90 degree days at the Boulder Farmers’ Market, but that didn’t appear to be the case this Saturday. Soon, soon it will top out in the 80s, maybe even the 70s. I hope. Nonetheless, there was great stuff available. This weekend I bought heirloom tomatoes, cherry yellow teardrop tomatoes, eggplant, purple potatoes, onions, yellow squash, bell peppers, garlic, yellow string beans, carrots, a French melon, a mystery melon (it was prominently identified, I just couldn’t remember it by the time I got home…or was it by the time I was at the next farm’s table? ), mixed baby lettuce, poblano peppers, thyme, apple mint, basil, and Street Fare mini-cupcakes. I tried one of the cherry yellow teardrop tomatoes and thought it was actually a little sour, so I decided the perfect use for them was the Maple Syrup Roasted Tomato recipe I saved from an issue of Saveur. I’ve made this recipe several times and am always astounded with how wonderful they taste. I used a lot more tomatoes than they call for (a pint), so I ended up using two garlic cloves, 1 Tbsp olive oil, 2 Tbsp of maple syrup, and about 5 sprigs of thyme. The actual roasting time was about 3 1/2 hours. These usually don’t make it off the baking sheet, because my husband and I walk by while they’re cooling and eat them all. 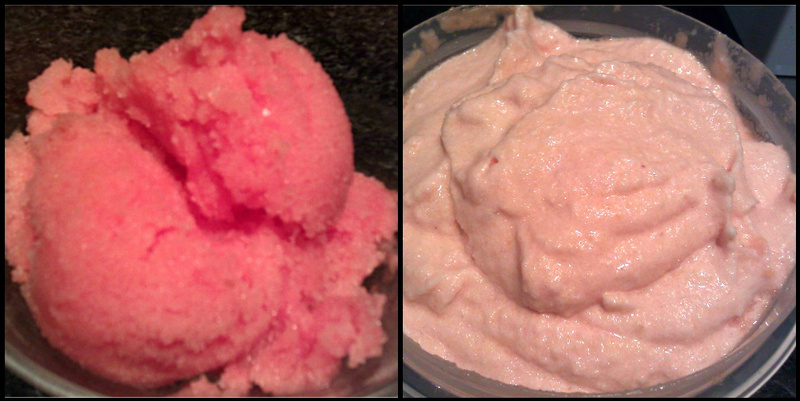 I also experimented a bit more with making melon sorbet, something I first tried earlier in the week. I found a recipe on a blog somewhere, but unfortunately wasn’t able to find it again. I guess given that there were only two ingredients – cantaloupe and watermelon, I probably don’t need to worry that I’ve stolen a secret recipe without giving proper attribution. The first batch I made earlier this week used even amounts of cantaloupe and watermelon, and I just used the food processor to liquefy it and then froze it. I left it overnight, and then attempted to smooth it out using the blender. (I should have done this a few times while it was freezing, but got busy and just didn’t). Since our blender is so lackluster when it comes to large amounts of ice without a liquid bribe (I just realized it sounds like I have to give it vodka or something), I ended up adding some condensed and skim milk to it. I refroze it, and it was some pretty nice, albeit quite icy sorbet. Technically, I guess it’s sherbet since it has dairy. I just don’t really like sherbet that much, so I have a mental block against calling it that. Saturday I tried a second batch using a French Melon (a muskmelon variety, muskmelon being the umbrella under which cantaloupe reside), as well as the Whatever Melon, which had a cantaloupe-honeydew taste. Unfortunately, I really should have gotten a watermelon instead of one of these two melons, because the taste was a bit too cantaloupey (it’s so fun to make up your own words). At any rate, this is definitely something I’m going to keep tweaking, because it really tastes like a dessert, but with no added sugar. An everyday dessert! 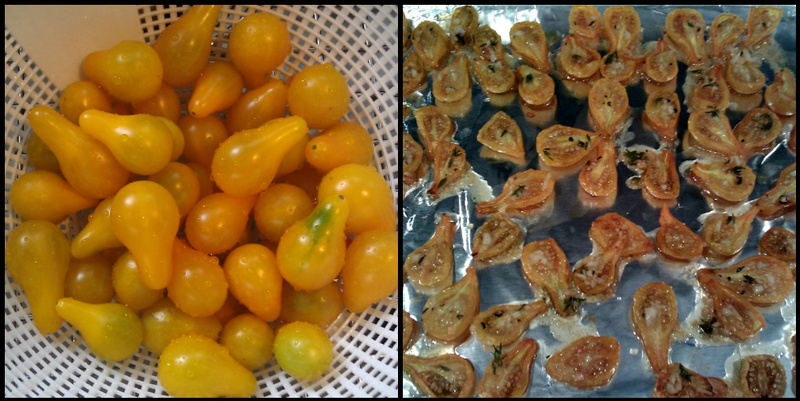 After making the tomatoes and the sorbet (sherbet), I wasn’t feeling too motivated to make a really laborious dinner. So I decided I would make a sort of risotto with the Pappardelle’s Supreme Orzo, and that I would use a few of the more fragile heirloom tomatoes for a side. None of the pictures I took of the tomatoes turned out that well, since I took them after brushing the tomatoes with olive oil, balsamic vinegar, garlic, and basil, making everything super shiny and reflective. They tasted awesome, though. For the orzo risotto, all I did was prepare it with half water and half broth, add some chicken sausage, sautéed vegetables and fresh thyme, and it was ready to go. The broth made the orzo flavorful enough that no additional sauce was necessary. (Plus Pappardelle’s pasta has so much flavor already). I’ll have to put this one on the list of simple things to make on busy weeknights. Combine the broth and water in a saucepan and bring to a boil. 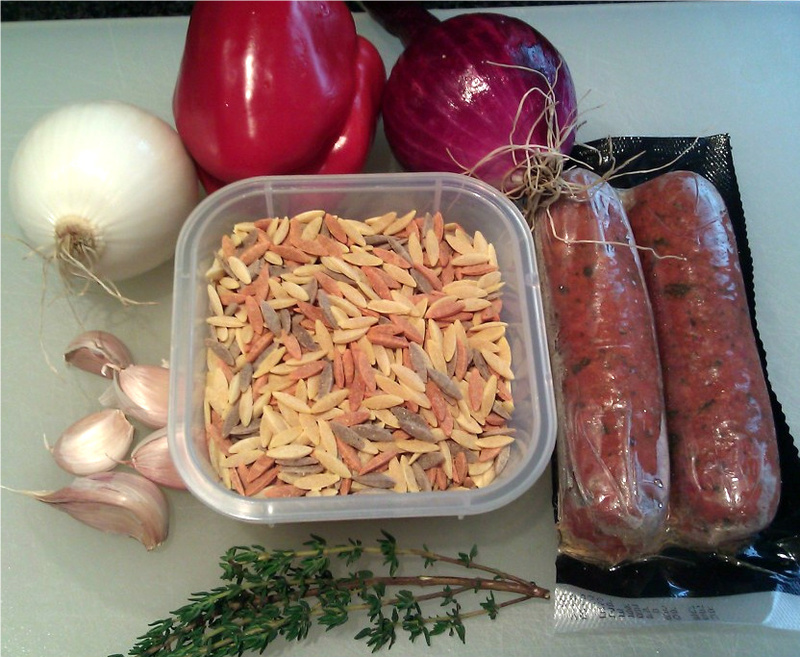 Add the orzo, and cook until tender and the liquid is absorbed, about 8-10 minutes. Meanwhile, heat the olive oil on medium heat in a skillet. Add the garlic and sauté for a minute. Add the onion and pepper, and sauté until tender. Add the sausage and heat through. 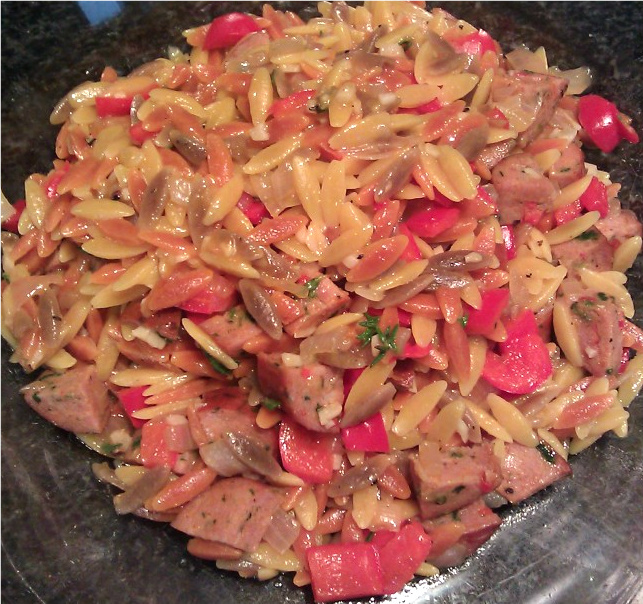 Combine the vegetables, sausage and thyme with the orzo, and serve. 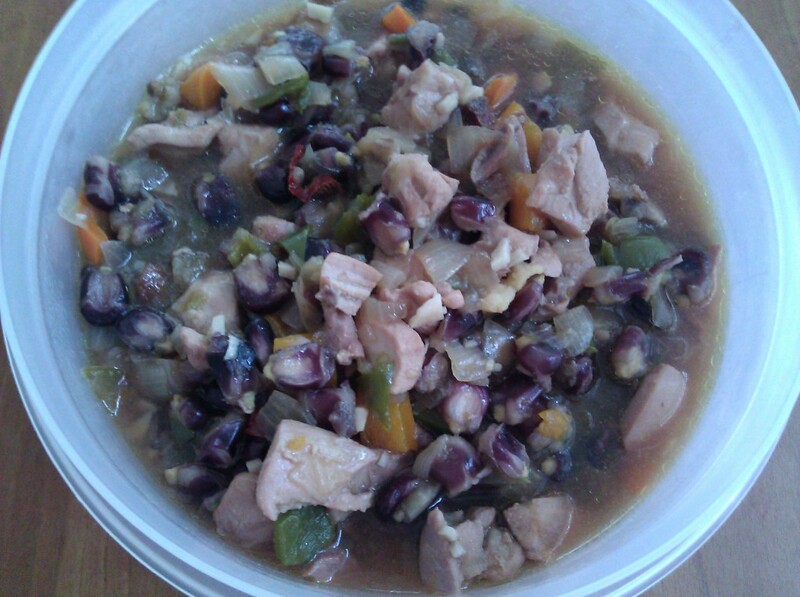 B’Stella-inspired black quinoa with turkey? What in the world does that mean, you ask? Well, as I was planning what to make for the week, I wanted to use the gorgeous black quinoa that I still had, and wanted to add a bit more protein to whatever I made with it. So I thought of ground turkey, and then went on the path of something with a bit of spicy heat, cumin, lime juice…but then I realized that I’ve made a few Southwesternish dishes lately, and I wanted to do something different. But I did like the idea of the quinoa and turkey, and the spicy part. And then in a train of thought that I really don’t recall, and can’t possibly be logical, somehow B’Stella came to mind. B’Stella (also called Bistella or Pastilla) is a dish with ground chicken in phyllo dough, topped with powdered sugar. But that’s a poor description of it. It’s so much more than that. I’ve actually only eaten Moroccan food (at least at a genuine Moroccan restaurant) somewhere between five to ten times, but have always loved it. (And, one of those times actually was in Morocco. We took a wonderful excursion into Morocco-Morocco (as I called it) from a port in Spanish Morocco during a Windstar Cruise. The highlights for me were the tour of the market and the lunch in a local restaurant). Anyhow, back to the B’Stella. I knew it would take quite a while to make the Heirloom Beans and Red Rice I made earlier in the week, so I had no intention of going the whole phyllo-dough route, but to just use the spices and sweetness of B’Stella as a theme for my dish. (And there’s the fact that quinoa doesn’t have a place in real B’Stella anyway). I pulled up a few B’Stella recipes to check the spices, and set off to make something up. I really had no idea how this was going to work (or even whether it would work), but I plowed ahead. I did a lot of tinkering with the spices and flavor while I was working on it, and went on a bit of a too-salty-add-vinegar-too-vinegary-add-sweet-and-spice sidetrack, but in the end it tasted quite good. I topped it with a bit of sifted powdered sugar by taking a spoon and pouring it through a fine strainer onto the top of the quinoa. A note on the saffron: you want to grind the saffron threads up before you add them to anything – if you have a mortar and pestle use that, otherwise just use the back of a spoon. Rinse the quinoa well, combine with the broth, water, and one pinch of saffron in a saucepan, and bring to a boil. Reduce heat and simmer uncovered until the water is absorbed and the quinoa is tender – about 20-30 minutes. Check it after 20 minutes and if it is not yet tender, but the water is gone, add a bit more water. Put the other pinch of saffron in 2 tsp of peanut oil, and set aside to let the saffron dissolve. Mix all of the spices together, except the salt and sugar (grind them from fresh spices if possible). Heat the other 1 tsp of peanut oil in a non-stick skillet over medium heat. Add the ground turkey, and cook until there is no pink left and the meat has started to brown. Break the meat up with a spatula or wooden spoon as it cooks. Set aside. Heat the 2 tsp of olive oil with the saffron in a non-stick skillet over medium heat. Add the spices to the oil, and let the spices heat up for about a minute until fragrant. Add the garlic, and saute for a minute or two. Add the onions and peppers, and saute until the onion is translucent. Turn the heat down to medium low or low, sprinkle the onions and peppers with the salt and sugar, and let them continue to cook for another 20-30 minutes until they are caramelized. Scrape the bottom of the skillet every few minutes (or more frequently if needed), adding small amounts of water as necessary to prevent sticking and burning. 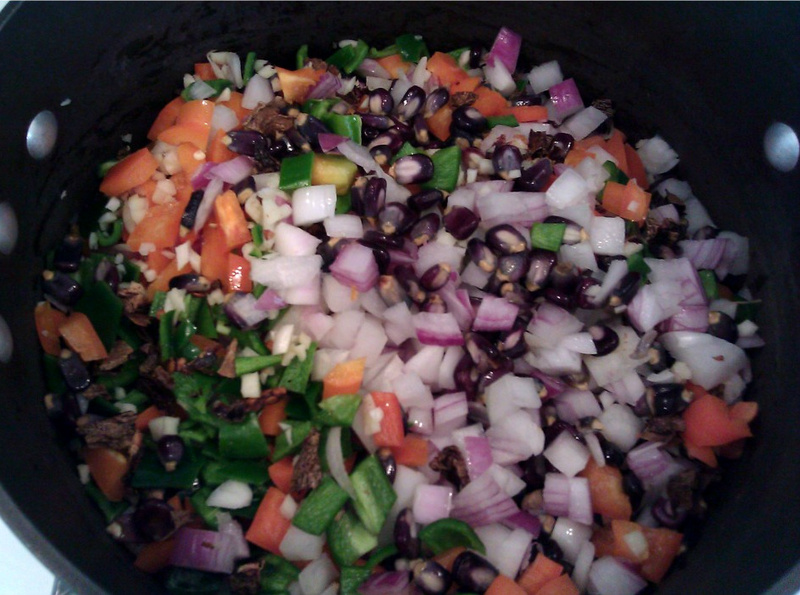 Once the onions and peppers are caramelized, add the balsamic vinegar, and continue to cook for another minute. Add the turkey, quinoa, and honey, and mix well. Plate, and then top with a spoonful of powdered sugar passed through a sifter or fine strainer, and then the almonds. The plated end product wasn’t being very photogenic, so here’s everything but the powdered sugar before I stored it for dinner the next night. The Peaches and Cream sweet corn from Munson Farms has been so extraordinarily tasty over the past few weeks that my husband specifically requested more corn this week. And I happened upon a blog entry from Vert Kitchen for Saffron Corn Chowder, so I definitely had my corn plan for the week. We met the chef and owner of Vert Kitchen, Noah Stephens, at a HUSH dinner a couple of years ago. He had recently opened Vert, and mentioned it, so when we were down in the Washington Park area sometime later, we stopped by for lunch. We weren’t disappointed. The food was phenomenal, and Noah even remembered us from the dinner, and stopped by to say hi. (Stop in and get the Curry Chicken Salad – I can still remember how it tasted and it’s been at least a year). I made two modifications to the recipe to make it more lowfat. I used evaporated milk instead of cream, and turkey bacon instead of regular bacon. And I made one other substitution out of laziness – chicken broth instead of chicken stock. I felt like it was a bit irreverent to make so many substitutions, but I knew I wouldn’t equal the original, and I like to keep my big dietary splurges for the weekends, so substitute I did. With my evaporated milk usage, the consistency was definitely more soup-like, but the taste was still spectacular. Sweet from the corn, but savory from the broth and bacon. Definitely worth a repeat! This week kind of wore me out, so this post is quite a bit shorter than I usually like to write. I’ve concluded that the ideal amount of new recipes for me to make in a week is 3, and no more. Work just zaps my energy too much to do one every night, but three a week is a good compromise. That way I’ll have time to really concentrate on what I’m making – and have more time to do a good write-up. As I was pondering what to make this week, I was thinking I should use the red rice that I bought a month ago at Whole Foods. I thought for a while, and then stumbled upon an amusing idea (self-amusing, anyhow) – instead of red beans and rice, why not beans and red rice? I planned to have 2 andouille chicken sausages left over after making the previous night’s Soft Spring Wheat Berries with Sausage, Leeks, Pepper and Mushrooms, but I needed some beans to use. So I browsed the bulk selection at the Boulder Whole Foods, and found some gorgeous ones – Zuni Yellow Beans and Colorado River Beans. Both of these beans are heirloom varieties, and the more I explore heirlooms of all types, the more amazed I am at the intense and varied flavors. We’ve made red beans and rice before with dried red beans soaked overnight and cooked, but they have never had anywhere near the wonderful flavor of these heirloom beans. And they are just so gorgeous. Unfortunately after they cooked, they both pretty much became a light brown color, so no vivid yellow, despite the fact that I ended up using mostly yellow ones with that hope. But oh well, the flavor more than made up for any color disappointment. I realized as I started making this dish that I was using heirloom varieties of 3 of the ingredients. 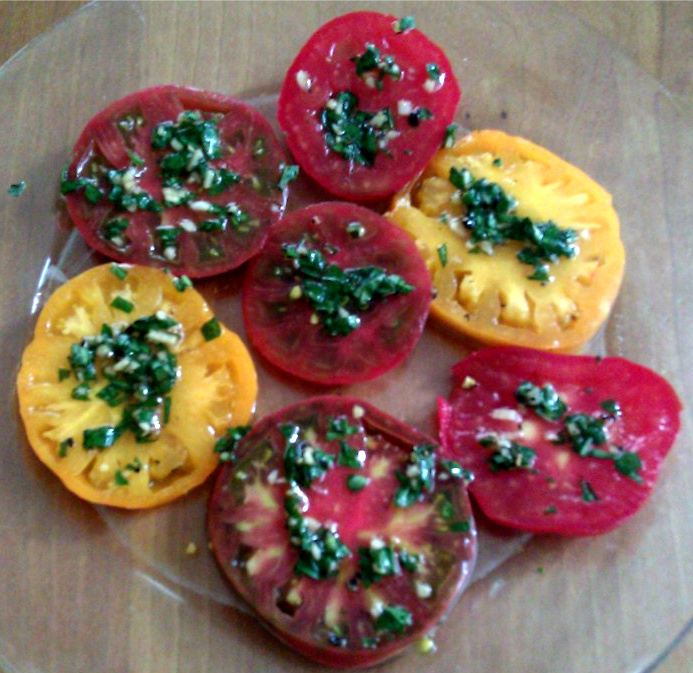 The tomatoes I used to cook down into a sauce were honking big, slightly strange looking heirlooms. For tomatoes, it almost seems that the uglier they are, the better they taste. These ones were so sweet when I tried some raw, they almost tasted like candy. I can’t believe that I spent so much time eating the long-distance shipped, bland, sour tomatoes readily available in the mainstream grocery stores. And I even ate them in the summer! The other heirloom I used was the red rice. Even this had a degree of robustness that its common counterparts, white and brown rice, lack. It was definitely bolder, and I would say almost meaty or smoky tasting. I cooked it in chicken broth, which I think brings the flavors of grains and rices out more than just water (But it doesn’t overwhelm them and make them taste like broth). This was definitely one of those tornado-has-hit-the-kitchen dishes. But hey – I own these pots and pans, so I’m going to use the #$%& out of them! (I just keep trying to justify the expansive pot and pan usage to myself in different ways as I’m doing the non-dishwasherable dishes afterward. I can’t always tell if I’m fooled, though.) Fortunately this made a pretty huge batch, so we’ll have 2 dinners, plus plenty of extras for lunch. 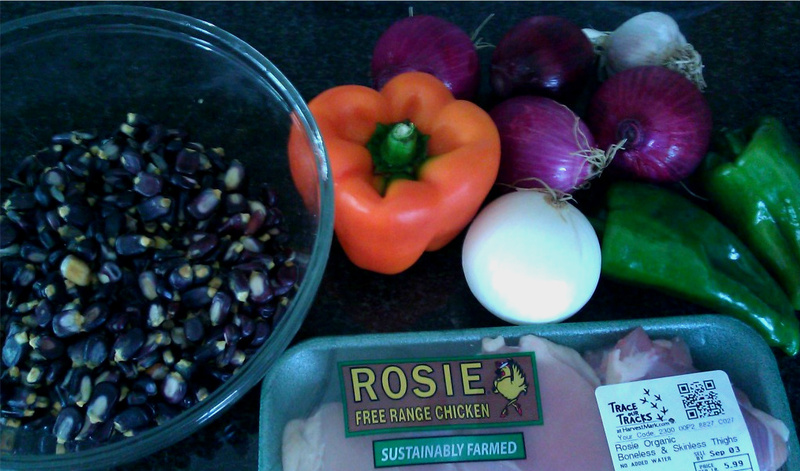 I planned this so the rice and beans would be done before the other ingredients. It’s fine if they cool down, you’ll combine them at the end. Cover the beans in a few inches of water, and soak 4-8 hours. Drain, and then add to a large saucepan with 6 cups of water, and bring to a boil. Reduce heat to a simmer, and cook until tender (about 75 minutes, but that may vary depending on the type of beans you use). Add the sausage at some point – I added it during the last 30 minutes, and probably could have put them in the whole time. Drain and set aside if the other stuff isn’t ready yet. Combine the rice and broth in a saucepan and bring to a boil. Reduce heat, and cook until tender. The packaging said about 30 minutes, but it actually ended up taking closer to 45 minutes for mine. Heat a skillet over medium heat, and then add the chopped tomatoes. Add the salt, sugar, liquid smoke and paprika once the tomatoes liquefy. You want to cook them until they reduce and thicken into a sauce, which will take differing times depending on what type of tomatoes you use. And it will seem like they aren’t ever going to thicken, but they will eventually. It took 20-25 minutes for mine to cook down. You may want to turn the heat up to medium high if the tomatoes aren’t simmering on medium. I turned it up and down a few times during cooking. Remove from the pan and set aside. Heat 2 tsp of olive oil in a skillet over medium heat. Add the garlic and saute for a minute. Then add the pepper, onion, and chile and saute two more minutes. Add the celery, and continue to saute until the onion is translucent and the pepper is tender. Stir in the parsley and cilantro. Add the tomato sauce, rice and sausage and combine well. (Technically for red beans and rice you’d serve everything over the rice, but that’s the nice thing about making your own recipes up – you aren’t obligated to meet anyone’s expectations).